Today gaming has reached to the highest level and the current GenX are highly fond of top quality video games with all the advanced technology. Earlier, we use to play video games on our mobile phones, but now advancement has made playing a video game like you are enjoying a full-on blockbuster movie. If you are a true gaming freaker and really want to experience a totally different world of gaming, then you should try video gaming projectors in 2017. The best and latests of its kind. Some of the best trending video games at the moment are The PlayStation 4 Pro, Xbox One Scorpio and Nintendo Switch. To understand and enjoy the top-quality display, you desperately need best possible set up competent of playing high-definition videos with 4K footage. 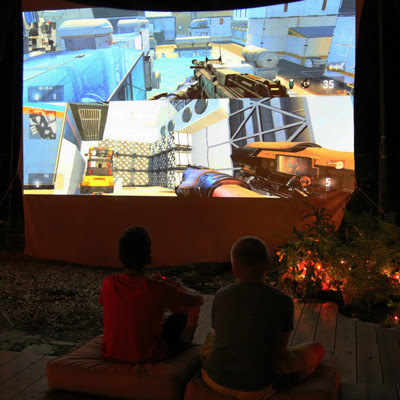 Here in this blog post, we are listing 5 best video gaming projectors which have immense capabilities of modern era’s video gaming consoles. These are certainly the best among gaming zone and you can pick one of them after reading the reviews. If we talk about the the best gaming projectors in the market, this GT1080Darbee from Optoma should be in first place. No matter, how giant or small is your living room, it has the ability to match up your level. Its 100 inch projector screen and 3.5 inch foot projector distance bring life to the images. It flawless features include two HDMI ports, built-in powerful 10 watt audio, 12 watt output, VESA 3D synchronization port and entire digital connectivity. The high quality image detection technique makes it possible that you enjoy gaming as of you are playing. Those, who loves technology driven advanced video games, your search is over now with this projector. Its colors reflects true picture of life and those who are seeking competitive touch in gaming, this projector meets the set of your choice. I am pretty sure that the qualities of BenQ DLP would surely satisfy the gamer. This unit of projector has built-in 10 watt speakers to enable plug and play facility. To give you best quality pictures, it has a smarteco mode controller which itself adjust the power. Its other attracting features include MHL connectivity, HDMI and full HD projector. Wireless full HD kit along with wireless reader allows you to provide you more smooth gaming experience. Its crisp and clear graphics with the true amount of brightness level make you feel a worth gaming exposure. ViewSonic PJD5155 is one of the slimmest and sleekest video gaming projectors having lots of exciting features that makes it among best selling gaming projectors. It has 3300 of lumens which brings awesome brightness. HDMI ports, RCA composite video jack, 2 VGA-in-ports, a mini USB port for managing audio and video are among its defining features. You can easily carry this projector as it is manufactured from very lightweight and durable. Text plays a very important role in gaming to read out the instructions and respond to the incoming commands. If you want to keep up the spirits of high tech gaming world, this one is best to add onto your list. It will meet high-end demands and benchmarks set by the gamers. Although, the price of BenQ HT1075 is comparatively lower than ViewSonic PJD5134 but it offers all the high-end qualities that require in a gaming projector. Its 10 watt speakers gives nice feeling to your ears. For ultimate picture quality and efficiency, this projector features with an innovative SmartEco mode technology. Its other dynamic features include 3D exposure, dual HDMI, resolution of full HD 1080p and MHL connectivity for mobile devices. Its brightness level is superb and image quality is very crisp with small details. It also has a wireless HD reader to transform a normal gaming experience into an out of the box involvement. Picture quality always play a major breakthrough in gaming and it depicts sharper and more clear images to show. HD141X from Optoma fulfills all your gaming dreams by offering 1080p high-end resolution with contrast ratio of 20000:1. This makesure that you will witness all the colors combined perfectly and in balance. Its 3D playback compatibility differs them from other projectors available in the market. Gaming enthusiastics can any time plug-in any of the 3D supportive device to this projector and you will get magnificent 3D content to watch the moves of your favorite games. It weighs 6 pounds and the lumens brightness is 3000 means very bright in lighting. Lifespan of 6500 hours, this projector has 2 HDMI ports, an audio port along with a 3D synchronization port. Overall, this is a good to go gaming projector and according to me, it will only add a fantastic gaming experience for all the gaming freakers. If you just love to experience a high-end gaming world and stay forward as compare to your friends, you should have to upgrade your gaming modem by adding one of the best video gaming projectors from this list.